‘Angelica luce nera’ (Angelica black light) is the light of our times, the light of which we say we have no prior experience, the light that is not a reminiscence of something, the light we do not wish to know what it reminds us of. Greece’s light has been obscured with a little blackness, it is not the light’s fault but of how we perceive it. There is still optimism, freedom, the pleasure of being able to drink coffee or Ouzo with friends for hours. But all these things are not as luminous as they used to be in the past, something very deep-seated is causing great worry and anxiety. This is not just due to what is happening but, most of all, to what is behind it all. My photography does not show specific events, it does not document or uphold any particular hypothesis about what is happening. 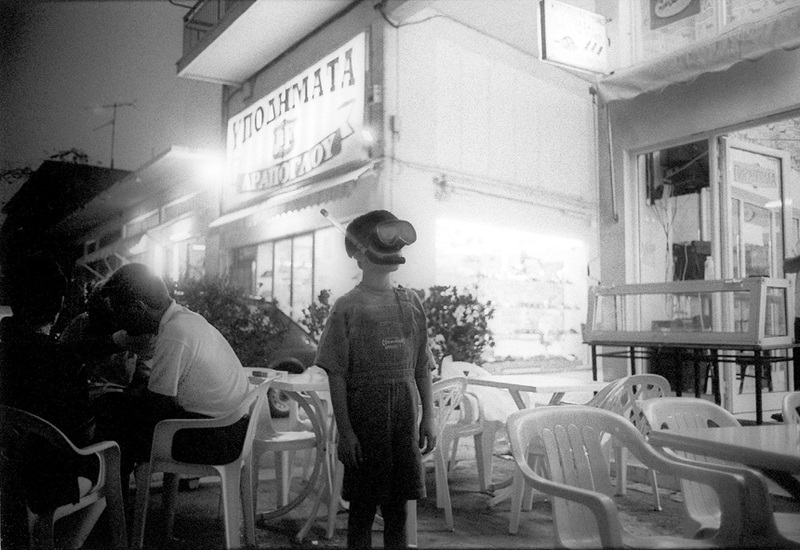 It seeks, rather, to create an atmosphere, to render feelings, to look at blurred lights and distorted shadows, to explore the characteristics of today’s black and white, shapes and styles, all these countless stimuli of everyday life that constitute the new visual reality in the eyes of Greeks in times of crisis. The event, in fact, is not a predominant feature in my photographs, I am more interested in its resonance, in the aura that generates something and persists in its wake. It is not so much people but their marks, their footprints, the dust kicked up by their heels, the memory that the rustling of their presence around us can create. What I am trying to do is not so much to talk about people’s situations, but to recreate their lives through photography. By using personal visual forms, I am trying to devise a clear photographic language that I feel I am constantly constructing but which I am not sure I will never be able to give a definitive form to. Ama definirsi il “flaneur” patito della street photography. Negli ultimi venticinque anni ha realizzato fotografie in bianco e nero. Recentemente ha cercato di aggiornare il suo stile personale nel ritrarre paesaggi e scenari urbani elaborando nuove modalità rappresentative. Ha viaggiato a lungo in Grecia e in Europa, accompagnato da sua moglie Nina Kassianou, celebre curatrice artistica greca. Nonostante questa sua predilezione per la fotografia outdoor, per molti anni ha lavorato come fotografo di scena nei più importanti teatri della Grecia. Una selezione di queste fotografie è raccolta in Shapes and Shadows from the Theatre, libro edito nel 2009. Ordolis ha pubblicato altri 6 libri. Ha studiato economia e marketing e ha lavorato principalmente come vicedirettore presso l’ufficio marketing e commerciale della Public Power Corporation in Grecia.